A number of ancillary events honoring renowned individuals in addition to the main conference are scheduled. An exhibit and dedication of historical and biographical documents and art works: "Ioannes Skarlatos the Artist - Alexandria - Antioch - Jerusalem"
Ioannes Skarlatos (St-Theodoroi, Imbros island 1907-Damascus, Syria 1956) was a Greek artist of international acclaim and renown. He studied at the Higher School of Fine Arts of Athens. He visited Jerusalem, Bethlehem, the Jordan River region, Alexandria Egypt and Damascus Syria. He illustrated themes and scenes of the Holy Lands as well as the portraits of Patriarch Christoforos of Alexandria and Alexander of Antioch. 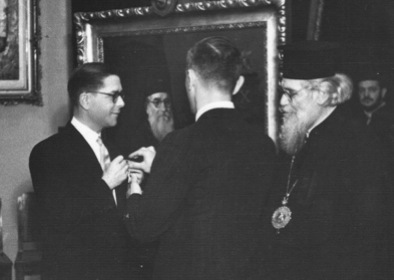 In 1953, he was awarded the highest honor of the Patriarchate of Alexandria, the Knighthood of the Order of St-Mark. Upon his passing, his burial, at the Greek Orthodox Cemetery of Damascus, received full honors of the State of Syria. Studies and research on his works and life have been undertaken, presented and published by Evangelos Andreou, poet and scholar of art style and aesthetics, in his work "Ioannes Skarlatos-An Overview of His Art, A Biography and Commentary" published in 1985 with many illustrations and reproductions of Skarlatos' works. Joseph I, Patriarch of Constantinople was a fiery and staunch defender of Orthodox Christianity. He opposed, with great zeal, the unification policy of Emperor Michael the 8th Paleologus (1261-1282) and was vociferous in his staunch opposition to the Imperial Mission to the Synod of Lyon (1274). After this Synod, he was forced to resign and was replaced by Johannes Vekkos who had migrated to the unification policy of Emperor Michael the 8th Paleologus. After the passing of Emperor Michael the 8th (1282), Joseph I was reinstated to the throne by Andronicus II Paleologus, however, he soon passed away. He was proclaimed into Sainthood and his commemoration is celebrated on the 30th of October every year. 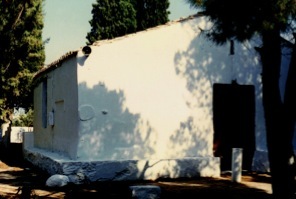 The Church of St-Athanasius was erected in the 17th century and is considered by the Greek State as a historical landmark. It is the oldest ecclesiastic shrine of Paeanea and served as the metropolitan cathedral until about 1720. At the site was the oldest cemetary (1660-about 1750). Surveys and excavations point to the existence of human tenements and a Christian community dating back to the 11th-12th century. The Church of St-Athanasius also served as the catholic of an abbey as attested by the names and the years of passing of two monks (1669 and 1671) referred to in inscriptions. 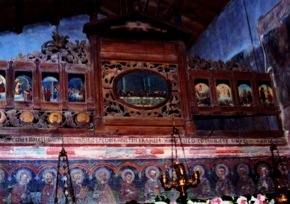 The frescoes are of some interest as they point to art of the post-Byzantine period (four layers of paint have been identified, the oldest dating to the 16th century). The iconography of the temple was apparently begun in 1773 ending with more recent layers at the end of the 18th centurt. St-Athanasius, the patron saint of Paeanea, is associated with legends and traditions that were respected even by the Muslim Turks which occupied the region during Ottoman reign. The church celebrates its feast day on May 2nd every year.